There’s nothing quite like the Great Lakes, and The Great Waters offers the three greatest to choose from: Michigan, Huron, and Superior. Paddling is one of the best ways to slow down and enjoy the serenity and majesty of these mighty lakes. Canoe, kayak, raft, even surf your way among The Great Waters – you’ll understand why these fresh water sea’s have drawn visitors for centuries. In the non-stop hustle and bustle of our lives today, Michigan’s eastern Upper Peninsula offers a chance to slow down and appreciate nature’s wonder from a vantage point unlike any other. You’ll experience places like the Tahquamenon River, one of the few rivers in Michigan designated as a National Wild and Scenic River. Make your way through the Great Lakes to glimpse the wonders of nature found here in these treasures. 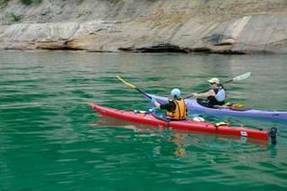 So don’t forget to paddle our lakes and waterways as you discover the Great Waters. A plethora of natural spectacles unique to The Great Waters awaits your exploration. Come and immerse yourself in our lakes and rivers and find out for yourself just why we call them the Great Lakes.